C1 Industry Based Constraints The Advertising Standards Authority (ASA) regulates the UK advertising industry. The advertising profession has adopted a code of practice which the ASA administers for all non-broadcast media. The code aims to ensure that advertisements provide a fair, honest and unambiguous representation of the product they promote, including through the use of words and impressions. The ASA gives guidance to advertisers on whether a proposed advertisement would be regarded as acceptable and deals with complaints from the general public about cases of allegedly untruthful, misleading or offensive advertisements. The ASA is not an enforcement agency; it operates on a voluntary basis. 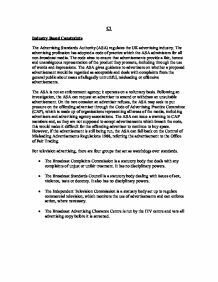 Following an investigation, the ASA can request an advertiser to amend or withdraw an unsuitable advertisement. 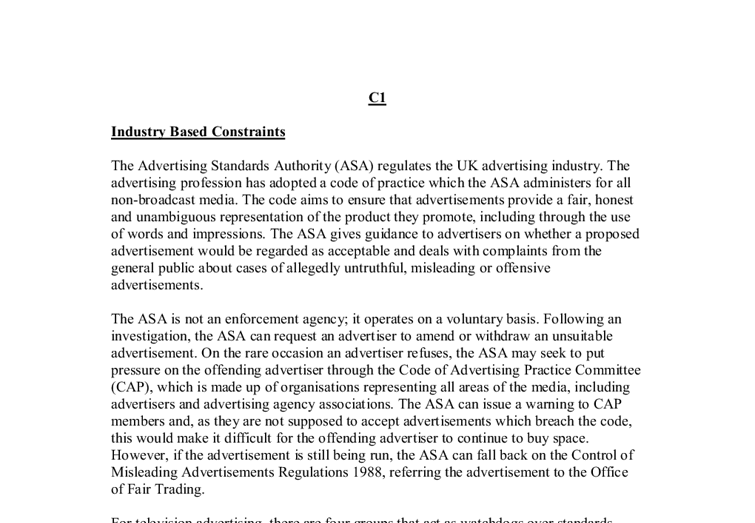 On the rare occasion an advertiser refuses, the ASA may seek to put pressure on the offending advertiser through the Code of Advertising Practice Committee (CAP), which is made up of organisations representing all areas of the media, including advertisers and advertising agency associations. ...read more. It also has no disciplinary powers. * The Independent Television Commission is a statuary body set up to regulate commercial television, which monitors the use of advertisements and can enforce action, where necessary. * The Broadcast Advertising Clearance Centre is run by the ITV centre and vets all advertising copy before it is screened. Ethical and Social Constraints Business stakeholders and pressure groups can have a constraining effect upon an organisation's marketing activities. Organisations need to establish a balance between satisfying the demands of these two groups, while implementing a marketing strategy which increases overall development, profitability and sales. Within an Organisation there are several business stakeholders, different groups of people with a personal interest in the future direction which the organisation takes. The shareholders want assurances of future profitability and high dividends, the managers want to maximise sales to reach their own personal targets, employees want better training and a fair level of pay. ...read more. The Act also covers the way in which goods are priced. The seller cannot charge a higher price than the one marked on the product. It is also illegal to claim that the price of a product or service has been reduced, unless it was previously offered at a higher price for a period of at least 28 days in the last six months. The Act was strengthened in 1972, introducing provisions which make it illegal to sell goods that have been manufactured abroad by trying to give the customer the impression that they were made in the UK. It can refer monopoly situations to the Monopolies and Mergers Commission, although the Secretary of State for Trade and Industry takes the final decision on whether a potential monopoly should be investigated to asses if it is against the public interest. The Monopolies and Mergers Commission can constrain or prevent a company from expending its market share through a takeover if it believes the company's actions might be detrimental to consumers. ...read more. states that this is wrong on two accounts. Firstly, it is the high risk of failure with a brand that acts as the barrier, "four out of five new products fail." The barrier is spending a million and possibly having nothing to show for it. team come up with the promotional campaigns on promoting on different races, bringing different cultures together and different religions together. The word used to express the creative concept is called 'Copy' where the words will be written by the copywriters. The company would mainly be targeting almost any one who is able to use the products and can afford one. When handing out the surveys although the products mainly attract youths the questionnaires would be handed to adults as well as they are the ones purchasing the product usually. To find out the best possible time in which to advertise, the respondents were asked what their favourite programmes were. This is so that adverts could be placed within the commercial breaks of these programmes to get the best possible audiences. The various ways the consumer is persuaded comes under the promotional mix. The promotional mix has all the marketing and promotional communications methods used to achieve the promotional objectives. These can be further broken down into two distinct areas: 1.